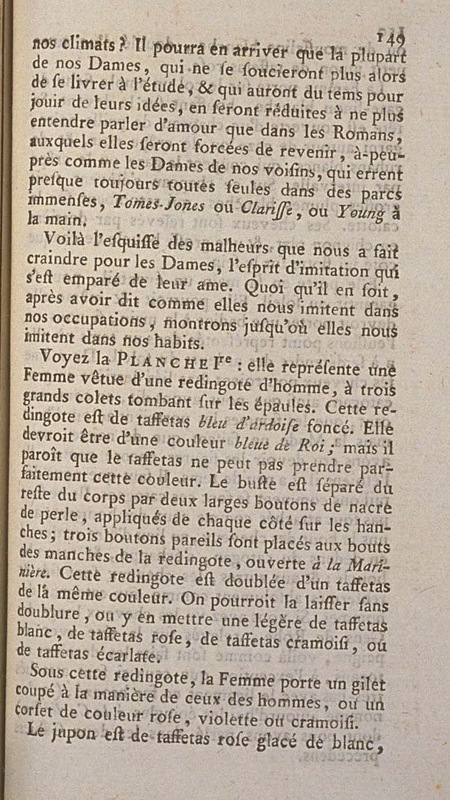 See the IST PLATE: it represents a Woman dressed in a man's redingote, with three large collars falling on her shoulders. This redingote is of dark slate blue taffeta. It should be of a King's blue color; but it seems that taffeta cannot perfectly take this color. The bodice is separated from the rest of the body with two large mother-of-pearl buttons, applied on each side of the hips; three matching buttons are placed at the ends of the sleeves of the redingote, open à la Marinière. This redingote is lined with taffeta of the same color. One could leave it without lining, or place in it a light one of white taffeta, pink taffeta, crimson taffeta, or scarlet taffeta. 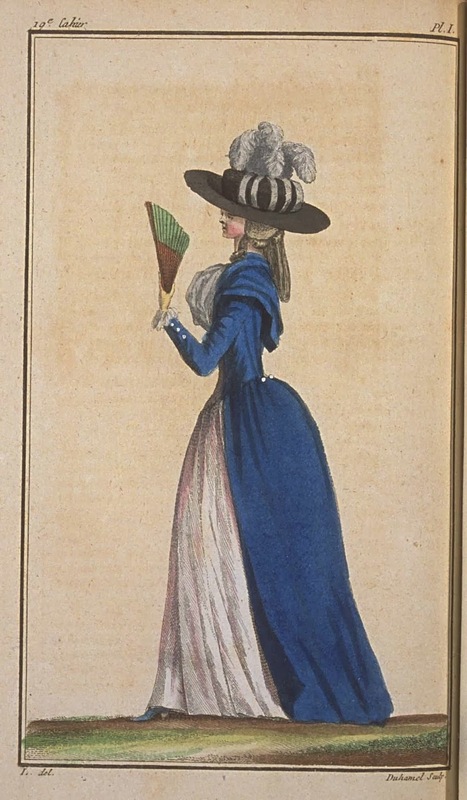 Under this redingote, the Woman wears a gilet cut in the manner of men's, or a pink, violet, or crimson colored corset. The petticoat is of white-glazed pink taffeta, or of white muslin, lined with another underpetticoat of pink taffeta. The Woman wears on her neck a full kerchief of white linen-gauze, puffed on the front. Her head is covered with a hat of black straw, trimmed around with gauze or black crêpe, and with white ribbons, which cut the gauze or crêpe at intervals. On this hat rise three large white plumes, which fall back over the crown. Her hair is pulled up in a flat chignon in the back, and a large curl on each side hangs on her chest. She carries in her hand a fan, to protect her from the sun. She could, and even should carry a walking stick in her hand, if we would have not represented her at a time when she had to defend herself from the heat of the sun. As far as that goes, her hair could be tied behind in a large cadogan, as we have said, in beginning, that women wear them today: but Fashion only giving it birth, we felt obliged to represent it as it was only a little time ago. We must detail how these cadogans are made. They are not all tied like men's; at one end the hair, instead of being contained within the cadogan, escapes and falls in curls; with others, the hair is tied and fully enclosed like men's cadogans. 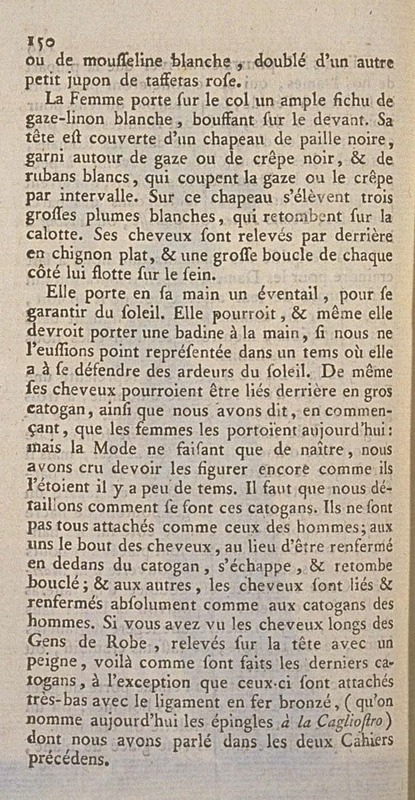 If you have seen the long hair of the Gens de Robe, pulled up on the head with a comb, thus are made these modern cadogans, excepting those which are tied very-low with the bronzed iron ligament, (that is called today a pin à la Cagliostro) of which we have spoken in the two previous Issues. The Woman wears on her feet shoes with flat heels, in taffeta matching that of the gown. This practice, as it is easy to see, has never changed. Shoes are worn in a stuff matching that of the gown. It is not however forbidden to vary the color. 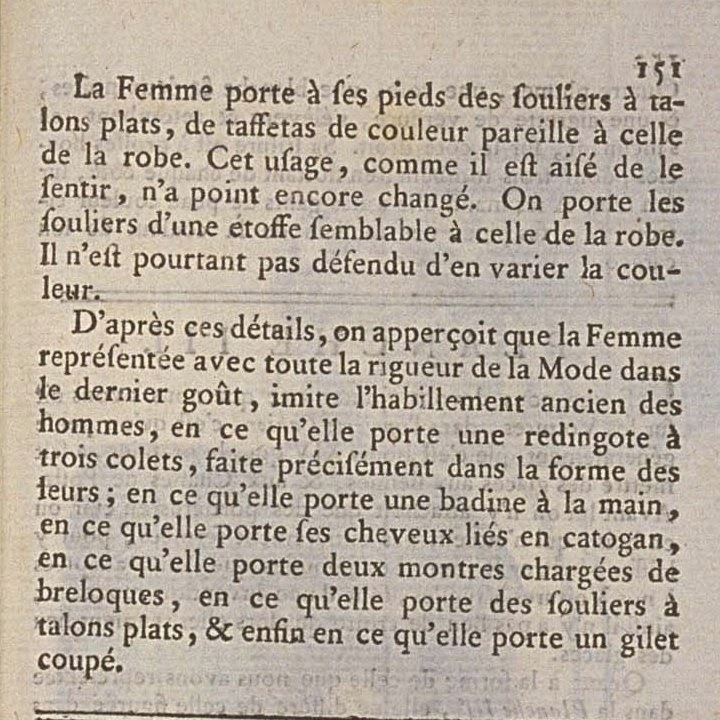 Following these details, one perceives that the Woman represented with all the rigor of Fashion in the latest taste, imitates the former dress of men, in which she wears a redingote with three collars, made precisely in the shape of their own; in which she holds a stick in her hand, in which she wears her hair tied in a cadogan, in which she wears two watches charged with trinkets, in which she wears shoes with flat heels, and finally in which she wears a contrasting gilet.